In 1893 West Ewell was a small hamlet in the Parish of Ewell, consisting of a handful of cottages and a total population of three hundred villagers. The inhabitants were self-contained, most of them making their living from the land. There was a Mission Room, situated in the building which now serves as West Ewell Social Club in Chessington Road. But people who wanted to attend the services in St Mary’s parish church had to walk the distance of nearly 2 miles across fields or along the narrow country lanes to Ewell village. During the summer, it was a pleasant enough walk along Chessington Road (formerly known as Marsh Lane because it led to Ewell Marsh), but during the winter it could be a rough journey. The railway brought prosperity to the area and with a regular service to and from Waterloo, many family men who worked in London moved out to Ewell. The advent of so many new families to the area brought problems to St Mary’s – which had been built 50 years earlier to serve a much smaller community. 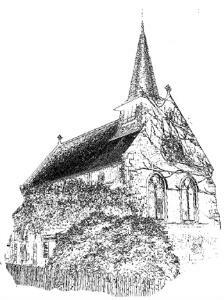 By the 1890s so many people were attending the services that a proposal was made to enlarge the church. Mr. Bridges, a churchwarden, established a fund and quickly raised over £3000. However, Major Glyn, who was the patron of the living, refused consent to the project so Mr. Bridges and some of his colleagues decided to build a daughter church in West Ewell. A further £1000 was raised by supporters of the new church, a piece of land was donated by Mr. Bridges and on the 2nd August 1893 the foundation stone was laid. Although construction of the new church progressed satisfactorily, lack of funds forced Mr. Bridges to amend the plans. Lack of funds prevented the building of the Chancel, Sanctuary, South Aisle and Lady Chapel. The result of the alterations was a church building that appeared to be out of proportion, the roof being far too high for its length and width. On 31st July 1894, All Saints Church building was completed and dedicated by the Bishop of Winchester. The task of turning the building into a place of a caring Christian community was placed in the hands of the Rev. G.H. Preston (the first curate of All Saints) and the churchwarden, Mr. Bridges. The very next day, the first of many fetes was held to raise money for church requirements. A year later sufficient funds were raised for the purchase of an organ, which was installed and dedicated in 1895. Holy Communion was celebrated every Sunday at 8.00am; Matins and Sermon followed at 11.15am with Evensong at 6.30pm. This arrangement continued until 1931. In 1896, Thomas Hill, a schoolmaster and his wife gave the church its marble font in thanksgiving for many years of happily married life. The font was dedicated on Sunday 16th February and immediately afterwards George Richard Hunt became the first child to be baptised at the font. Ever since the church was first built, discussions had been ongoing regarding the building of a church hall in which community activities could be held. A committee was appointed whose task was to organise the construction of a hall. The first plot of land purchased was in Chessington Road but Mr. Bridges thought that the hall should be built next to the church. The site in Chessington Road was sold and the site next to the church was purchased with the proceeds. In 1919 the committee went to Aldershot to inspect an old army hut. This was subsequently dismantled and re-built next to the church on the meadow. In 1923 the new Diocese of Guildford was created and on the 1st May 1927 the Parish of All Saints, West Ewell was transferred from the Diocese of Winchester. Rev. Guy Milsom Jukes came to All Saints in 1929 and it was during his ministry that on 8th July 1936 West Ewell became a Conventional District with the power to appoint its own Churchwardens and to elect its own Parochial Church Council. Under this agreement, All Saints became financially independent from St Marys and a new era began for the church in West Ewell. One of the first problems encountered by the new council was to find a way to enlarge the church (which was rapidly proving too small for the community). Plans were drawn up and presented to the planning committee of the diocese. However, with no hope of the funds being raised by the diocese or from the Parish of All Saints, the PCC had to be content with minor improvements, including the construction of a new vestry. Rev. Milsom Jukes retired from All Saints in January 1939 and his place was taken by the Rev. Norman Walker. Aged 52 when he came to the parish, this ex-schoolmaster was a man of immense size and power. He was a man of great determination and under his leadership several changes were made at All Saints. One of his first actions was to instigate an All Saints magazine which quickly had a circulation of 500. Another man who played an important role in the church was Joseph Coomes, a churchwarden who spent his years of retirement looking after the church and churchyard. It is largely due to his influence that electric lighting was installed in 1939. During the war the church hall was requisitioned by the Borough Council for use as a British Restaurant and in 1945, when the war was over, was taken over by the Surrey County Council as a school canteen for Danetree Road School. The future, as far as the Rev. Walker was concerned, meant trying to bring about two of his main ambitions: the completion of the church to accommodate 300 parishioners and persuading the Commissioners to accept All Saints as the parish church of West Ewell. Once again plans to enlarge the church were drawn up and approved by the church commissioners in 1950 but, with the estimated cost being in the region of £20,000, the dream never materialised. His second aim was, however, successful and on the 11th October 1952 the church was consecrated and Rev. Norman Walker was inducted as the first Vicar of All Saints. It was a sad coincidence that in the year in which he realised his ambition, he also mourned the death of his wife, Minnie. Her death was a tragic loss, not only for him, but for the whole parish. It would be hard to over-estimate the value of the support she gave her husband and the parish of All Saints. It was Mrs. Walker who, in 1939, established the All Saints branch of the Mothers Union. In 1960 the need was felt to improve the facilities of the church hall. Three years later, Bill Lynam (a member of the PCC) suggested that a new hall be built on the church meadow, which was the name of the field which adjoined the church. It is now the site of the Vicarage. However, as there was no chance of raising the £3000 required, Bill Lynam asked for the use of a small plot of land behind the existing hall. Despite opposition, the hall was eventually built using funds raised by jumble sales and fetes. The Webber Hall came into existence. In 1966 it was decided to build a new Vicarage on the church meadow. The building was completed in April 1968. In the 1960s Rev Walker was ageing and without the support of his wife seemed no longer able to offer All Saints the leadership it required. This is not a criticism of the man but a comment on his determination to carry on until the very end. In spite of advice to retire, he remained Vicar until his death in 1972, aged 85. By this time the church building was dark and gloomy, the antiquated lighting installed some 40 years earlier was in need of repair, as indeed was the entire building. The number of parishioners attending the services had fallen and it was suggested that the entire church should be demolished, and the congregation move to St Marys. There was no doubt that All Saints was in need of strong leadership and luckily this arrived in the form of Rev. Christopher Vallins. Chris Vallins was ordained Deacon at the age of 23 and when he came to West Ewell was one of the youngest vicars in the country. Although he lacked the experience of his predecessor, he possessed the same determination. He immediately set about improving conditions at All Saints - his first major project being the enlargement of the church. He was not content with the size of the hall and set about a massive campaign to raise £60,000 to build a community centre that could be used by the whole of West Ewell, regardless of religious beliefs. In spite of numerous problems, Rev. Vallins gathered a team of people who dedicated themselves to the project and pressed on with the venture in the belief that what they were doing was both right for the church and right for the community. The south wall was demolished, and the building extended to make provision for a new aisle and extra seating together with a new vestry being created. New heating facilities were installed in the church, which was also rewired. The old hall was demolished, and the new Community Centre was erected in its place. The entire project took two years and was completed in 1975. Many organisations benefited from the new hall, including Sunday School, Girls Friendly Society, Brownies, the Church Lads Brigade, Girl Guides, as well as various clubs and the nursery school. In 1981 Rev. Laurie Smith became the new vicar at All Saints. He was a very sincere, prayerful man who worked very hard to please everyone. In 1990 Rev Alun Hurd replaced Rev Laurie Smith and it was during his time as Vicar of All Saints that the church was ‘re-ordered’. All the choir stalls and the large pulpit were removed to make way for a large carpeted area at the front. The Lady Chapel was also removed to make way for more seating. During Alun's time as vicar the worship changed with the introduction of an electric keyboard to add to the variety of music being played. This led to the production of our own song book, to give greater flexibility in the choice of songs. A new sound desk was built to provide a better quality to the service and worship. It was during Alun’s ministry that All Saints moved from being a more formal middle of the road Anglican Church to a more informal Evangelical Anglican church. In September 2005 Rev Ian Whitham replaced Alun Hurd. During Ian's time we bought more comfortable seating, which gave us the ability to be more flexible about the seating arrangement of the Church. The different styles of worship continued to grow and flourish, with the introduction of more modern songs. A new style of Church - Cafe Church - was introduced and it welcomes many new, young families to the church for a more informal, relaxed service. We held our very popular ‘Music On The Meadow’ for a number of years, where local schools and groups entertained the community in the afternoon and the audience could partake of refreshments such as a BBQ, tea and coffee and cake, ice creams and soft drinks and a beer tent. Rev Ian Whitham left in June 2015 to take charge of a parish in the New Forest consisting of 3 churches. In July 2016 our first lady Vicar, Rev Sue Cooke was appointed. Sue brought with her a new energy and passion for growing the church and reaching out to our wider community.